I thought you do have a "light gem" of sorts? It's that little blue light on your watch that turns on when you're visible and turns off when you're not (diegetic UI ftw). Isn't that just with Exodus, the last game? Don't think it's in the old games. It's a shame that there aren't more developers that release these kind of games. Edited by Carnage, 15 March 2019 - 04:27 PM. I'm too old for shooters... they stress me too much... <snip> nowadays shooters are much more hectic than old school ones anyway. for me too. I play games in my own pace. Instead of playing those beautiful Metro games, i watch walktroughs of them. The last shooters i played are the Stalker ones. I love those realworld openworld survival games. Edited by freyk, 16 March 2019 - 02:34 PM. Good to hear there's a lightgem in Exodus; I'll definitely be getting that when I've finished these two! I did glimpse the edge of a watch on my wrist once but no way to use it. I seriously wish I could hide weapons and clipboard! I'm forced to have one or the other on screen ALL THE TIME in any combat area. Reminds me of those Thief fan mission videos where the player plays continuously with the cosh held up! Everywhere is really tense - but becomes doable as you learn each checkpoint. I'd even say 'easy' compared to some games. By that I mean, a section feels near-impossible then after a few attempts it's suddenly over. That Cursed Station was like "You go and kill the monsters and get the bomb and block the airlock and blah blah on your own and we'll wait here!" Yeah right, thanks guys. But you're right Carnage, stealth worked wonders. If you crouch in the dark with light off then they can pass right by you. I think only if they collide directly with you do they know you're there. So that whole Cursed Station could probably be done in like 5 minutes? That's the perfect balance for me. Hope it remains that way. Compare Fallout 4 where there are places that are impossible to fight or stealth until you have enough weapons/armour etc. But that's a true open-world game and you just don't go there till you're ready or can back away if you do accidentally. Metro is a linear corridor game where you can only move about within locations along a fixed path. Incidentally, when I downloaded, I estimated the 2nd game to be 3 times bigger? I had a really bad checkpoint-repeat-forever with the Blacksmith guy further on. He blocked the door with a locker turned and ran out the opposite door. I was still paralysed by the cut-video thing. Soon as control returned I dashed after him and thought I saw him stagger to a halt waiting for me. I ran up behind him to wait. A guard came along and killed me. No matter what I did it was Groundhog minute over and over and over and over. Grrr! And I hate that the checkpoint is mostly the cut-scene where you have no control! Why do they bother with forcing the player to endure that? Better to have a new checkpoint just after he blocks the door! Anyway, I finally decided to run ahead past Blacksmith. Died. More than once. But eventually got a bit further. Suddenly I realised there's a guy running ahead of me - it's the Blacksmith! WTF? I died. Eventually it dawned on me that when he blocked the door and ran around the corner he raced ahead and probably bumped a guy who looked much the same as him who then staggered forward and stopped. In my line of sight I didn't notice the real Blacksmith running ahead (there were different people moving about.) It was one of those switch illusions (there's one on Youtube or recent TV I think where a guy asks street directions, two more guys walk between them carrying a door or something and the last of those switches places with the original talker. He carries on asking directions of the man in the street who doesn't notice it's a completely different person! Apparently that works on most(many) of us. You see what you expect to see. Anyway, it was both annoying and funny at the same time. Enjoying this game so far! Oh, one last thing before I go. Anyone thinking of playing this, the compass on the objectives clipboard POINTS THE WAY! That is brilliant! It's edgy switching between gun and compass but at least you know where to go. That's corrected me loads of times where I've gone past a turning or whatever. Good video Aosys! Big too. I'm only halfway and have to break off. (BTW anyone who hasn't got it, get 4K video downloader! It's brilliant for grabbing vids so you can watch them off-line anytime.) Interesting how different people have different complaints about the same game. Much of his criticism was stuff that didn't bother me much but he never was bothered by what I didn't like. Which supports my long-standing proposition that OPTIONS is the way. The perfect game has loads of options to play in different ways. Of course, that costs more and wouldn't solve his complaint about the English voice acting etc. I was more involved in the gameplay and what they were saying than how indifferent was the voice-acting. Now I'll probably notice! Anyone know a good free fiction website where you can simply click and download without joining anything? I've been searching and searching for the Metro 2033 book. I'd prefer it in html quite frankly but ebook is okay. Every website I visit leads you round in circles with false links or 'join for free trial'. Only gutenberg is open and free but they don't have this book. The internet is swamped with websites that don't truly work, that trick you into false clicks or downloads that don't work or the classic: 'if this doesn't download in 1 minute then click here' and they never download so why bother? Freeware is another example. I was watching a bit more of the above video and he mentions the game doesn't convey the protagonist's real motive for what he's doing. That reminded me of the Goblet of Fire movie which didn't convey why Ron Weasley was really annoyed at Harry Potter for entering the tournament. The book brings that out better. Makes a big difference when you know so perhaps this vid game might feel even better if I understood that. So that whole Cursed Station could probably be done in like 5 minutes? Incidentally, when I downloaded, I estimated the 2nd game to be 3 times bigger? Suddenly I realised there's a guy running ahead of me - it's the Blacksmith! WTF? Yes, it can be done in about 5-10 minutes when you know where you have to go. I think the second game is about the same length as the first game or slightly bigger. I found the second game easier, because a lot more can be done with stealth. But maybe that's also because of the experience I gathered with the first game. Because on my second run with the first game all feels a bit easier and I have died a lot less times. I'm not sure he's the blacksmith, as that guy that is running in front of you gets killed if I can remember correctly. After that part you get saved by the blacksmith or did this chase happen after you where saved by the blacksmith? I had no idea about this. It's kinda annoying though that you have to bring it up. They certainly improved it then in Exodus to make it visible all the time. Thanks for letting me know though. It's certainly handy to know how much more filter time you have. Edited by Carnage, 16 March 2019 - 05:23 PM. Also, fun fact: it's not just the compass that points the way to objectives. If you pay very close attention, you'll notice your lighter's flame/smoke also does too! Thanks, I'll check the PS4 controls later but I don't recall a wristwatch button. In fact, I've pretty much pressed every button multiple times. Actually though, that reminds me I've bought and acquired other items like dynamite or something or grenades and no way to use them. I mean, the right front button throws knives and that's it. I see no way to switch in other types. Also is wipe mask auto? I've never done it. Also I can't really tell if my mask is on or off except by donning/removing it a few times to see the movement! I've often spent a long time 'indoors' without realising my mask was on. Finally found out how to get that weapons menu on ps4 - hold triangle and use D-pad. Been playing ages and only just discovered grenades and stuff I've got! Also found the watch! It's visible almost off-screen all the time he's holding a double-handed firearm! 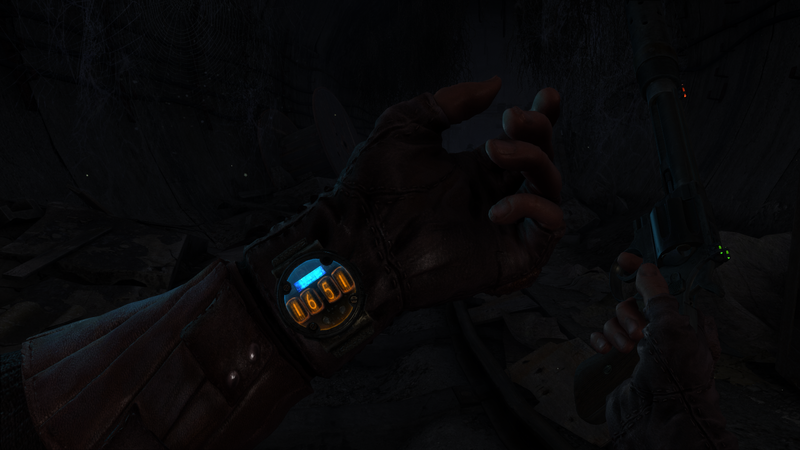 I was vaguely aware of some graphic down there but never looked closely at the weaponry thing so didn't connect it in the gloom with the glimpse I'd had of seeing the watch fully in some animation. I'd been expecting a button press to bring up the wrist. Still not found the mask wipe control though but I think it must clean itself in time. I mean a few splatters of blood on the visor would be useful so I know I'm wearing it! Also just remembered the charger! I thought the light was a bit dim! But I'd only ever used that charger once near the start and played all this time! Seems to me the light maybe never totally fails? So a quick Google search later, and it looks like to wipe the mask is to quickly tap L1? It goes without saying the mask has to be on to do this, but in my experience it's never been automatic. It's also kind of limited in utility sometimes, but still a neat detail. Also just remembered the charger! I thought the light was a bit dim! But I'd only ever used that charger once near the start and played all this time! Seems to me the light maybe never totally fails? No, it will never fail. In the second game you'll make sure that it is charged though. Because there are some monsters that you can kill with your light. Edit: It might actually fail if you keep it on constantly. But it will recharge till minimum automatically when you turn it off again. Edited by Carnage, 19 March 2019 - 12:04 PM. Good. Got night vision now so three methods of lighting the way! Also found how to bring the watch up fully - it's on the same menu as the charger and and lighter. That's the problem with icons if you don't recognise them. And I assumed it was something not yet working same as the night vision. It was there all the time, a victim of poor game info. And finally got to throw dynamite and found it's not effective against sitting demons because they fly off soon as it lands and before it explodes. I don't suppose one can delay it pulling the pin on a grenade but waiting a second or two before throwing. This game is certainly well-paced with a good mix of combat and stealth. The devs have certainly learned from the mistakes they made in the first game. I actually found out about some functions in the second game that were available in the first as well (so yes, poor game info). The part where you have to burn the spider webs is another example. I actually had to look it up online, because I didn't know how I had to continue. The pace of the second game is also better. 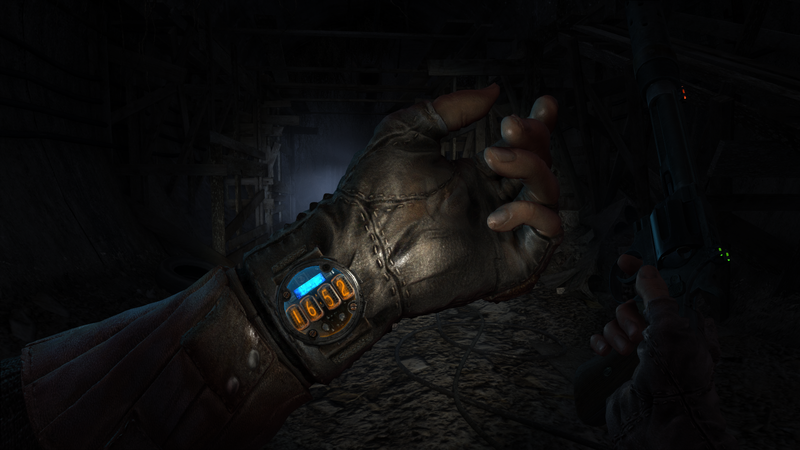 The first part of Metro 2033 could and I think did turn a lot of people off, while it really got better after a while, like you notice now. The second game continues the pace you're experiencing now. Edited by Carnage, 19 March 2019 - 03:58 PM. Not sure but I've sometimes accidentally gone through spider webs with no problem so don't know what the burning is for. I mean, if you lose health (as if bitten) then that would make sense. I still can't really judge health anyway until a message says medikit. I sometime think I need to use a medikit but if I click it then it just flashes and nothing happens. The only time I get to use a medikit is when the message shows. BTW don't think I've mentioned, the lighting is very good in this game. There's a lot of darkness but there is ambient light except for a few short places where you can use a light briefly. Visually the light is ideal imo. Yes, you can almost always go through them. There's just one time that you can't. It's when you meet Khan the first time and you move through the tunnels with the ghosts. Would you have known to use your lighter in that moment if I didn't tell you the lighter can be used to burn spider webs or where you able to pass it without lighting it? Yeah, I love the lighting. It really adds to the atmosphere. Exodus is even better in that regard and I'm really saving up some money to buy a computer that can run it. Couldn't quite finish 2033. I scraped though the D6 chapter with no ammo and began the final chapter with no ammo and about 1 minute of a filter left. I did find one filter which gave me about 2.5 and I did manage to get across the car park just by stabbing and even got up the tower and get a gas mask with, presumably a filter. But I ran out within seconds of killing the demon up there. So no way of finishing the game. I restarted the chapter a few times but never reached the tower again no matter what I did. There's just that one box of ammo near the truck and precious little else so that end was doomed from the start for me. I mean, scavenging takes time and I had only seconds to live. I think they assume everyone will begin it with some filters. In D6 there was very little to find so I'm not keen to reload that far back. I scavenged a lot throughout this game but iIf I were to play it again I'd scavenge even more. Without filters there's nothing one can do to finish. I'll probably start Last Light tomorrow with that in mind. The original 2033 had a 4-stage light sensor on your watch where red was completely visible, yellow was moderate, green was well hidden and black (no light) was completely hidden, but I found the AI to be very temperamental and they would spot you in a second from across a large room even at green. You were better off breaking line of sight whenever possible and ignoring the light system unless you absolutely had to cross open ground. I'm not surprised they streamlined it into a binary system for the sequels, because it felt binary in practice. just before that open hallway that leads to the tower. I was always too busy dying to go scavenging at that point but now I'll try again to see if I can finish it! 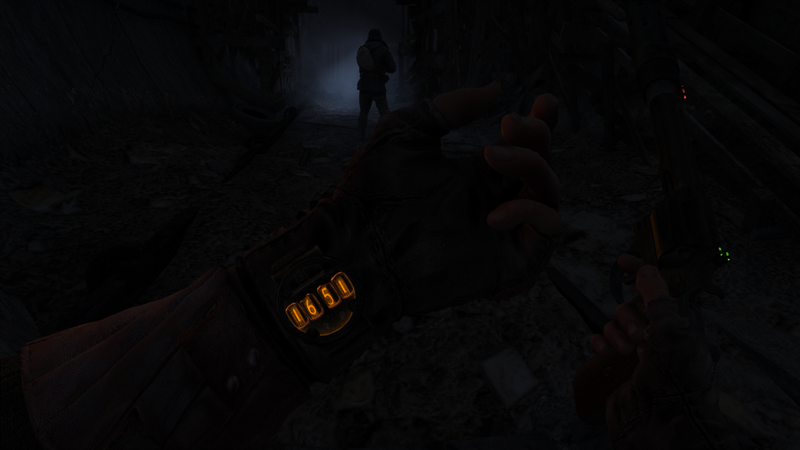 There's a special wristwatch worn on Artyom's left wrist (used in conjunction with the gas mask, for timing), which also includes a little red-yellow-green diode that acts as a light gem. Red = in plain sight, Yellow = still visible, but less so, Green = hidden in shadows. This is actually one of the few examples of an indicator of light-and-shadows stealth I've seen outside of Thief. Only near the end did I find out how to lift the wristwatch and only after beginning Last Light did I discover how to reload my weapons! Both are only mentioned once as a brief popup while you're fighting for your life - miss it and tough luck. Even if you see about the watch (and I never did) it doesn't work if you are showing the clipboard! So, even if you try the tool selector icon it doesn't work so you assume that's a future tool like say night vision goggles and forget about it. Talking of which, just before I exited to the swamp in Last Light, the character with me waved vaguely and muttered something like 'put that on'. I searched around for what the hell he was talking about. Eventually I found a kind of suit in an open closet. Clicked it. It's on. WTF it is I have no idea and never did find out. Made no visible difference to anything. I don't even know if I look cool in it because it's 1st person. Anyway, after a huge effort I had to give up Last Light too because it was impossible to get past Red Square with the limited ammo and filters I had. I entered there with seconds of life left. After several reloads of the checkpoint I found a filter which gave me a minute - then another. Not sure it would matter though because I was helplessly outnumbered, brightly lit, and just kept repeatedly dying and restarting. Three or four sessions of that and I'd had enough. I checked on the net for a video walkthrough. The guy must have had a filters cheat or something because he never even looked at how many filters he had left. Plus a better weapon. He nonchalantly took his time picking off the assailant above one by one. None of them came down till later. With me, I shot one or two then was overrun every time. I laid down mines near the window they came out off but they must have just avoided them or were too strong for them to matter. Nothing I tried worked. I saw from the vid that an exit opens up later but it never did for me. It was no fun at all. Overall there were some great battles though, and good stealth but often it was a matter of reloading checkpoint after checkpoint - learn by dying then act out a sequence that worked. That big momma for instance, all my ammo ran out in seconds. I resorted to stabbing it until my hand hurt. It seemed unkillable so I checked for a walkthrough. Again, the guy had infinite ammo, but at least I saw it could be killed and that was the only way forward. Back to the stabbing... my hand still hurts from two days ago. Great game spoilt by lack of info and bad checkpoints where it can literally save as you are dying! I think Rockstar have got it right with their 'three-reloads-then-a-skip-option' which means you at least get your money's worth. I recall in Red Dead 2 having to rope a runaway bull. I had never once succeeded in roping even a friendly horse so I knew I wouldn't be able to rope this MF. I gave up and waited to die each time until the option came. I certainly won't be paying full price for the 3rd game in the Metro series knowing the chances are I won't be able to enjoy the whole game. Not sure I'd even pay a tenner for it now. I'm now downloading more content for Fallout 4 - at least I'm certain you can't fail that game because there's so much freedom to regroup and try again under better circumstances (plus true gamesaves!) On and off, I had TWO YEARS' WORTH of enjoyment with Fallout 4 which is brilliant value. And now I get to play it even more! That's a shame Fidcal. Exodus should probably be a little bit easier on the normal modes, as that is something you see in quite a few games now compared to the 'old days'. I also ran out of filters a few times in the last part of 2033, never had that problem though in Last Light. The filter thing is nice but also a bit restricting, as you want to check everything and you can't. In the last part of 2033 there are also quite a few scenes where filter time is used, but you have to wait till the NPCs do something, and they seem to have all the time in the world. An option where you can borrow some filter time from the NPCs a few times would certainly have been helpful. As far a I know you can activate a god mode and unlimited ammo in a .cfg file, but I never did, so I can't tell you if it works or not. That would explain though how that person in the video seems to have unlimited ammo. Some people seem to have problem with the cheats, the below link should explain how to get them working if they are not. Maybe an idea to use them for some difficult parts, so that you can continue the story? Not sure if these work for Last Light as well, after doing a bit more research. If not, and you're not too far in the game, maybe an idea to play in Spartan mode and not survival? Edited by Carnage, 31 March 2019 - 07:22 PM.